Rwanda (/ruːˈɑːndə/ or /ruːˈændə/), officially the Republic of Rwanda (Kinyarwanda: Repubulika y'u Rwanda; French: République du Rwanda), is a sovereign state in central and east Africa. Located a few degrees south of the Equator, Rwanda is bordered by Uganda, Tanzania, Burundi, and the Democratic Republic of the Congo. 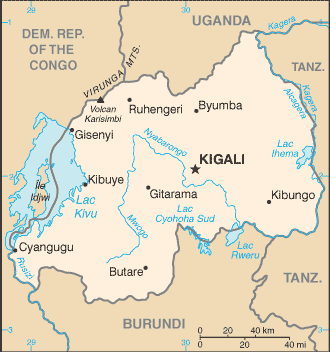 All of Rwanda is at high elevation, with a geography dominated by mountains in the west, savanna in the east, and numerous lakes throughout the country. The climate is temperate to subtropical, with two rainy seasons and two dry seasons every year.